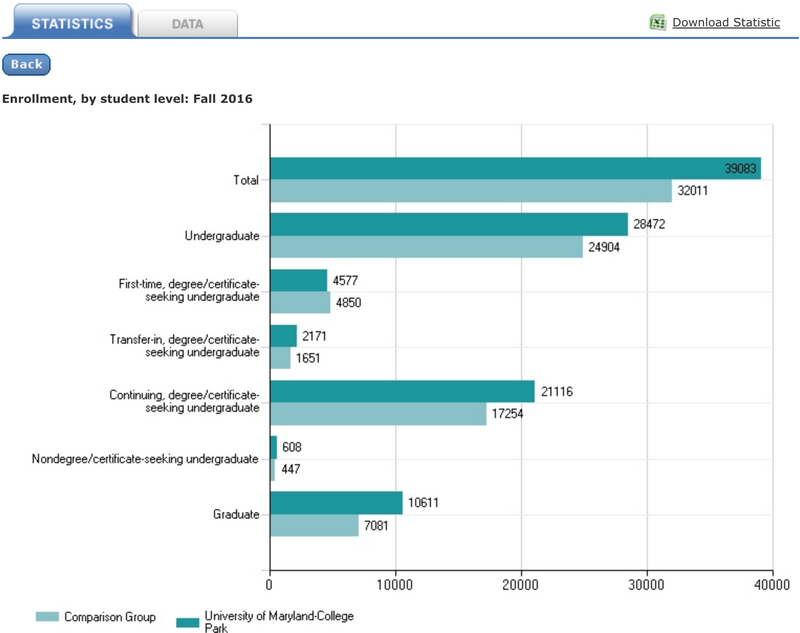 This data tool allows you to download, print, or customize an institution's Data Feedback Report, an annual report that graphically summarizes selected institutional data and compares the data with peer institutions. Start by selecting the institution that will serve as the basis of comparison for the report. Unlike other Use the Data tools, selecting a Comparison Institution is required for the Data Feedback Report tool. 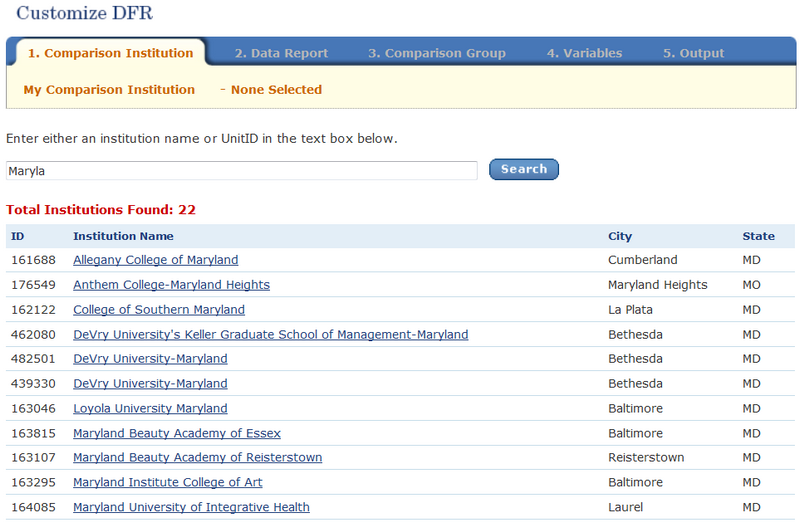 To select a Comparison Institution for the report, enter a search value in the box provided. 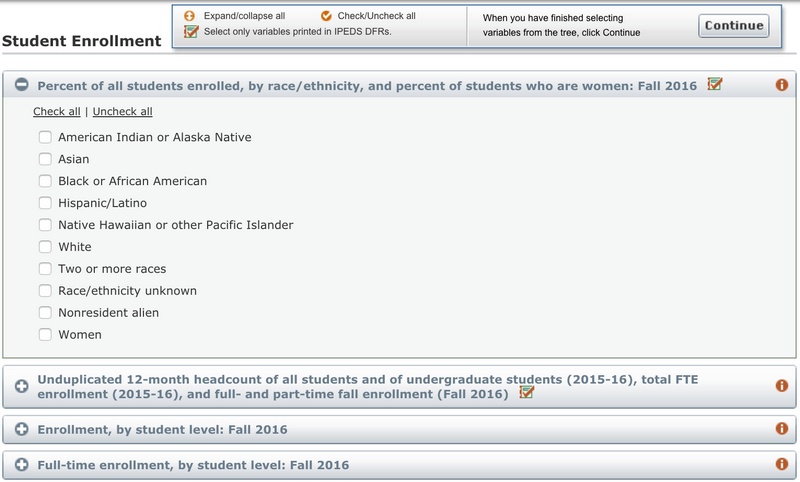 You may search for an institution by entering the UnitID or institution name (full or partial), as shown below. A list of potential matches is automatically displayed as text is entered. Click on the desired Institution Name to select it as the Comparison Institution. Once a Comparison Institution has been selected, the system will automatically continue to the next step of the report building process. The selected Comparison Institution will appear in the status bar at the top of the screen. This status bar is displayed at all times for reference. The Change button can be used at any time to modify your selected Comparison Institution. To view detailed instructions on selecting a comparison institution, please click here. Next, select the type of report you wish to generate from the links provided on screen. You may choose from the following options. 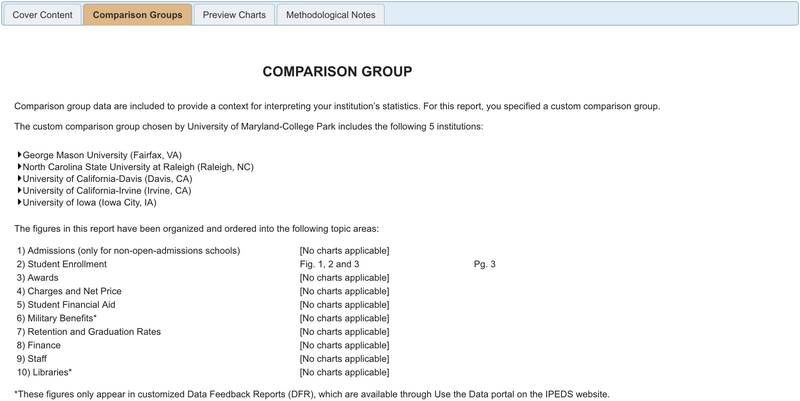 You can view the annually released IPEDS DFR for the My Comparison Institution or any institution in the Comparison Group by clicking on the Data Feedback Reports link on the upper right hand corner of the screen. This option provides commonly accessed statistical data based on one or more individual variables which may be used to evaluate the selected institutions and its peer group. An example of these variables is shown below. These statistics and the data making up the statistics may be downloaded in Excel format for further analysis. This option produces customized charts based on one or more figures to evaluate the selected institutions. These returned charts can only be downloaded in PDF format. In this option variables cannot be individually selected. Variables must be selected by groups called figures. An example of these figures is shown below. After opting to generate either a Statistical Analysis Report or a Custom DFR, the system will automatically continue to the next step of the report building process. The selected data report type is added to the status bar at the top of the screen for reference, as shown below. The Change button can be selected at any time to modify this choice as needed. A Comparison Group is required to generate a Statistical Analysis Report or Custom DFR. This group must include a minimum of one and a maximum of one hundred institutions. Otherwise, you will be required to adjust the number of institutions before continuing. In addition, a minimum of three peer group institutions must be selected in order to calculate a Comparison Group Median. The Comparison Group can be changed as many times as you like, particularly if you do not want to use the comparison group used in the standard Data Feedback Report. For detailed instructions on methods of selecting institutions to include in the Comparison Group, please refer to the Shortcuts section on how to Create, Save, or Upload Institutions . 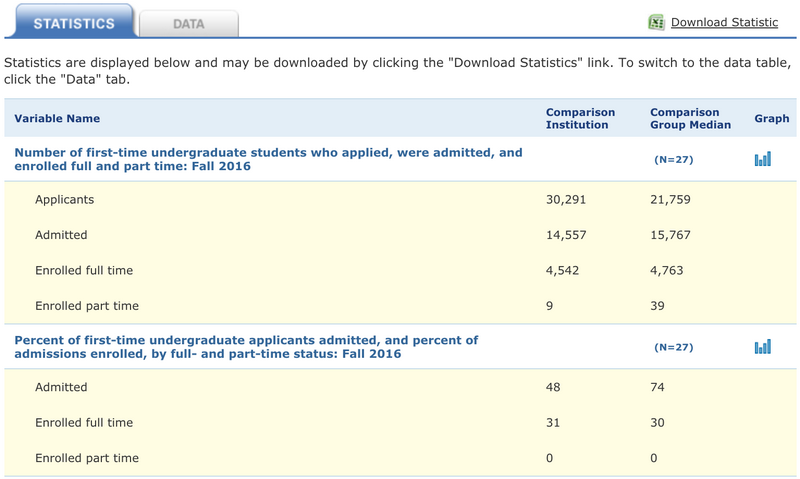 When finished selecting institutions for the Comparison Group, click Continue to go to the next step of the report building process. This data tree includes all of the data available in the printed IPEDS DFRs, and additional data derived from selected IPEDS data from the latest collection year. The icon is used to indicate data that are included in the printed IPEDS DFRs. You may browse the tree by clicking on the icon to expand a section of the tree or the icon to collapse it. To view a more detailed description of any section of the tree, click on the adjacent icon. A help window will open with additional information about the included data. A toolbar is available at the top of the screen with the following additional options for navigating the tree. Expand/collapse all: click on this option to automatically expand (or collapse) all sections of the tree to view/hide the variables listed under each figure. Check/Uncheck all: click on this option to select the entire list of variables/figures, or to clear any selections that have been made and start again. 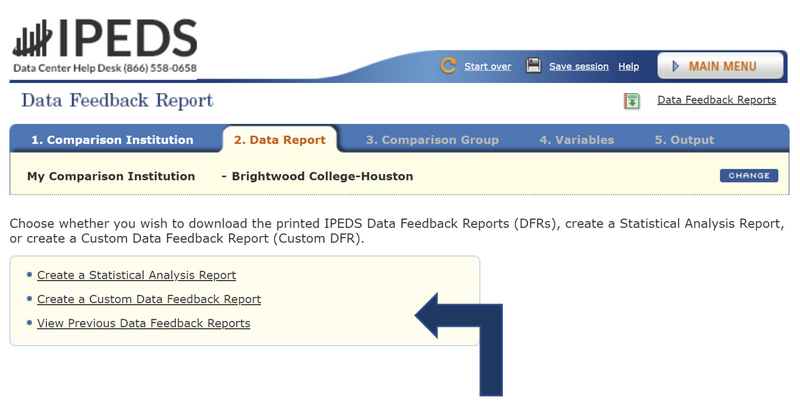 Select only variables printed in IPEDS DFRs: click on this option to automatically select all variables/figures from the printed IPEDS DFRs for inclusion in the report. When making individual selections, click on the corresponding checkboxes next to the variables or figures to include in your selected report. For this report type, you may select multiple variables from the various figure sections of the tree. For this report type, you may only select figures (groups of variables), but may not choose individual variables. The Change button may be selected to return to the Variables tab at any time and modify this choice as needed. Depending on the type of report selected in Step 2 (Statistical Analysis Report or Custom DFR), the output options vary. This section outlines each report and the various formatting options available for customizing the output. The Statistical Analysis Report results are organized under two tabs: the Statistics tab (shown by default) and the Data tab. The Statistics tab contains a table highlighting the Comparison Institution value alongside the Comparison Group Median for each of the variables selected in Step 4, organized by figure, as demonstrated in the example below. The statistics are available for download in Excel format under the Download Statistics link. The graph icon is available for each figure to display the data in bar graph form, as shown below. 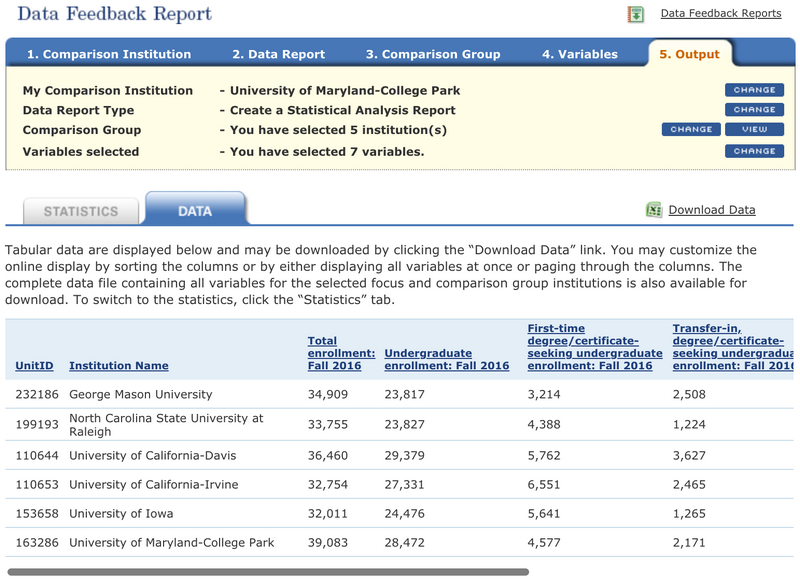 In addition to the summary statistics described above, you may click on the Data tab to view a table containing raw data for each institution in the Comparison Group (including the Comparison Institution) for each of the variables selected in Step 4, as shown below. Click on a column heading to sort the list of search results accordingly. By default, results are displayed in ascending order (A-Z or lowest to highest numeric value); however, you may click variable column headings multiple times to toggle between ascending and descending order. As with the Statistics tab, you may click on the Download Data link at any time to download these data in Microsoft Excel format. The Custom DFR can be viewed on screen, or downloaded in printable PDF-format which will use the same basic layout as the annually released IPEDS DFRs. The on screen Custom DFR is organized under four tabs: Cover Content, Comparison Groups, Preview Charts, and Methodological Notes. By default, the Preview Charts tab is displayed and includes a graph for each figure selected in Step 4. 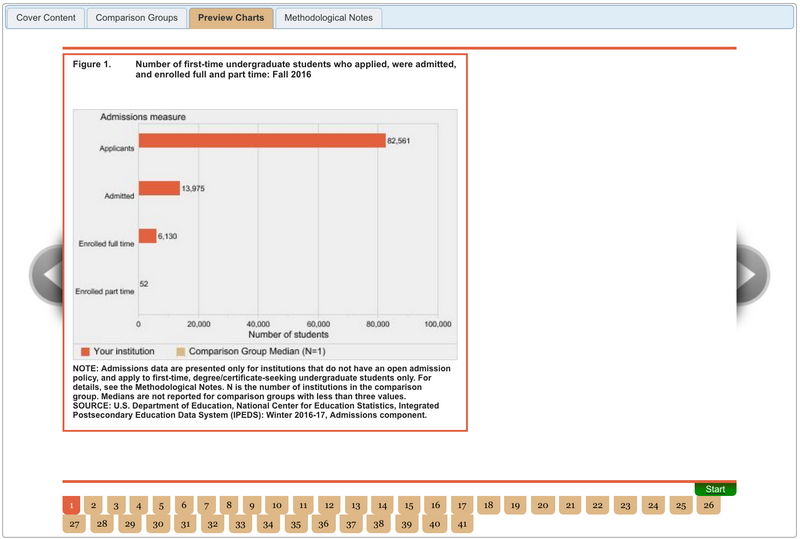 Each graph highlights the Comparison Institution value alongside the Comparison Group Median for each of the variables included in the figure, as demonstrated in the example below. If two or more figures were selected in Step 4, you may click the icons located to the left and right of the screen, or use the tab(s) below the table to navigate between figures and view each applicable graph. To view the graphs in an automated slide show, click the Start icon. Click the Stop icon to return to manual navigation. 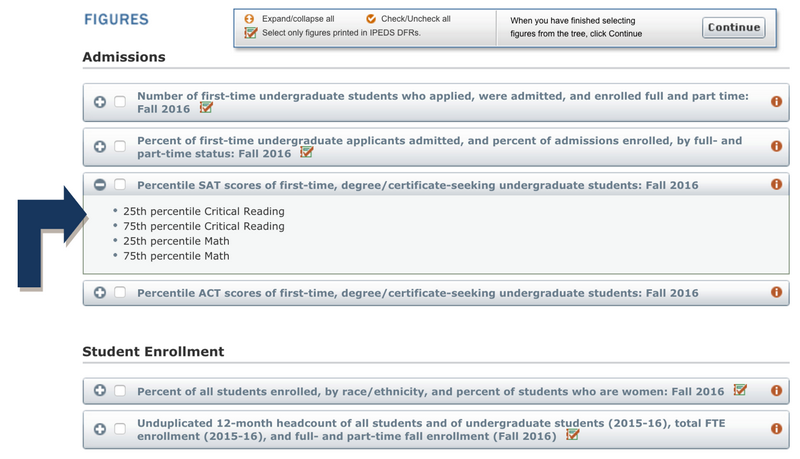 In addition to the graphs described above, the Cover Content tab includes a brief overview of IPEDS and the Custom DFR; the Methodological Notes tab includes a process overview and various definitions; and the Comparison Groups tab allows you to view the group of peer institutions selected in Step 3, as shown below. To download the Custom DFR, click on the Download button at the top of the screen. A description of the Comparison Group may be entered before download in the text box provided, as shown below. If entered, the description will be included on Page 2 of the PDF document. Use the status bar at the top of the screen to modify the report settings at any time. When finished reviewing or downloading the reports, use the Main Menu to navigate to a different task in the Use the Data portal; or, click on Start Over from the navigation menu at the top of the screen to end the current session.